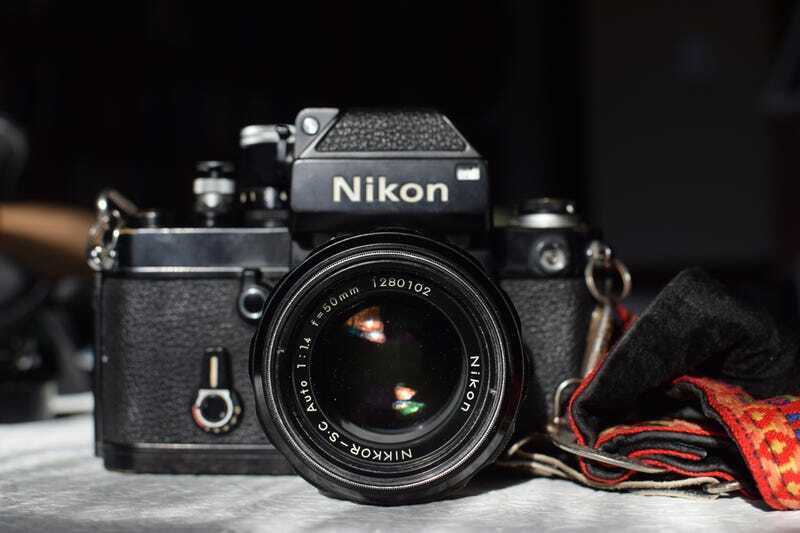 This was my father’s Nikon F2. He was told it wasn’t worth fixing and gave it to me. This camera holds great significance for me. It documented my entire family history from 1974 when Dad bought it, to 1996 when my parent’s divorced. This humble little device also took the myriad random photographs that my parents took simply because they liked to. It is, along with my parents, responsible for my interest in photography. At some point after my parents divorce the camera stopped working. As such I hadn’t seen it since before then. The lens. A non-Ai, 50mm 1.4. Other than some dust on the Hoya filter not a blemish on the glass,and the focus is nice and smooth. The lens body definitely shows some wear and tear. As does the body itself. Some of that is probably when my three year old self pulled it from its perch atop our dryer into my skull. You can’t have this awesome strap hanging from a dryer and not expect a kid to pull on it. Weirdly, this strap is almost as important to me as the camera itself. When the leather ends finally tear, I’ll probably have it repaired. Still has a film card in the back. I’m gonna leave that there. “What’s wrong with it?” You might be wondering. From the best I can tell, it’s just the DP-1 Prism head thing. I put new batteries in it and cleaned all the contacts. I tested for voltage at the two contacts that go to the head and was getting over 3v. Which if I’m getting power from where the camera body and head meet and it still doesn’t work, it is likely borked. Luckily they’re not too expensive. Before I buy that I’m running a roll of film through it. If there are any other issues I will just send the entire thing to get refurbished. My complete(for now) film camera line-up. And that non-Ai 50 works on my D3300!